New wireless ‘mesh’ data logging system. Gemini Data Loggers, producers of the Tinytag data logging range, is launching a wireless 'mesh' data logging system, improving reliability, robustness and staff management time. Designed to cause minimal disruption to a variety of systems, the 'mesh' network operates using a radio frequency transmitter system to send 'real time' information directly to a central source. This takes away the inconvenience of manual downloading such as labour, health and safety issues, measurement inaccuracies and time lag. 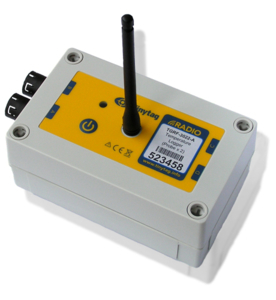 The system consists of a network of data loggers, and a central receiver which is connected to a PC. The loggers can be positioned in a mesh matrix up to 200 metres away from each other, and can transmit data back to the receiver through other loggers, hopping back the data to the receiver. This intelligent technology means that if a logger's direct contact with the receiver is blocked, it can still transmit data back to the receiver through contact with the neighbouring logger. Lost data through connection is a thing of the past. Using the Tinytag Explorer software brings even more benefits; it is simple to select data from each logger, channel or site, and through internet or internal network connection it is possible to view data from multiple sites through one PC, reducing labour time and cost. It is also possible to create a variety of graphs, tables and charts simply from the software to use in presentations or reports. Remote alarm signalling and SMS alerts mean that if there is a problem with one of your sites or loggers, you can take corrective action even if there is no-one present at the site. Wireless mesh networking gives you local recording, the fastest access to 'real time' data, and the quickest response. This new intelligence will save you both time and money, and ensure your data is as reliable as possible.